Just as photographer and installation artist Pam Longobardi finished one of her most recent pieces, the Deepwater Horizon oil platform blew up in the Gulf of Mexico. 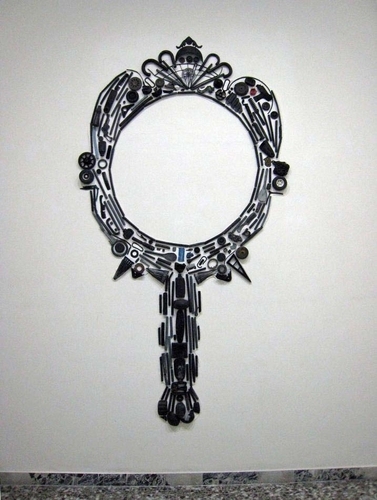 It was April 20 and Longobardi was completing a large wall construction, roughly in the shape of a hand mirror, created entirely of bits of black plastic she had collected from beaches. Longobardi, a professor of art at Georgia State University, has exhibited around the world, including venues connected with the Beijing Olympics and the Venice Biennale. Her resume includes more than 40 solo exhibits and numerous commissions. She’ll be in Alaska to speak in Anchorage and Seward this week. 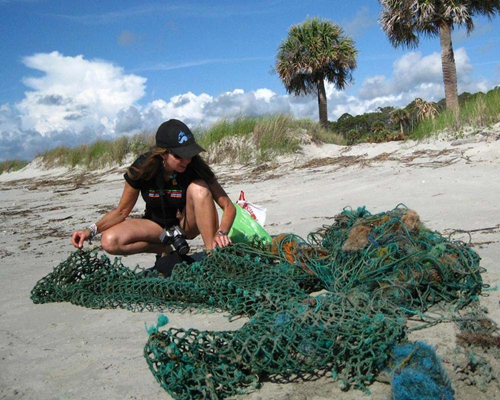 For the past five years, her recurring subject has been oceanic debris. She has created the Drifters Project, an ongoing collaborative and interdisciplinary project focusing on marine junk and plastics pollution. In a phone call from her home in Atlanta, she described her work process. She walks beaches, takes note of piles of ocean-borne garbage and reflects on what it says about the relationship between the natural world and human culture. That material is then used in conjunction with the photographs to create her installations. “I’m interested in getting people to think about their own connection to plastic,” she said, “because 99 percent of the debris is plastic. A lot of things are objects of personal hygiene. Toothbrushes, hair barrettes, cups, plastic bottles, everyday objects. Plastic is a major component of consumer society. 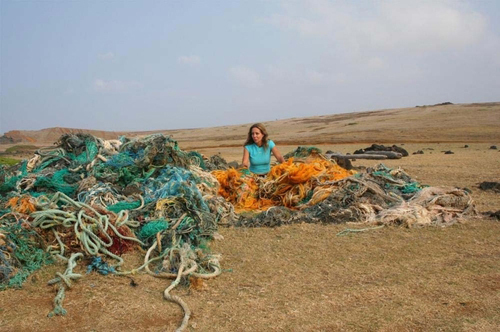 Howard Ferren, director of conservation for the Alaska Sealife Center in Seward, which is hosting Longobardi, hopes her visit will help initiate a project that will lead to an exhibit focused on Alaska using marine debris as an art medium. Durability, the quality that makes plastic convenient, presents a problem when tons of it are released into the wild. Ferren gave the example of albatross chicks on Midway Island, near a giant, permanent, floating raft of discarded material called the North Pacific “garbage patch.” Unwitting parents feed bits of plastic to the chicks until their stomachs rupture. Ferren is contacting international artists who use marine debris as found art material, such as Longobardi, with the idea of fielding an expedition to Alaska’s remoter shores. Collected material will “wind up in an art exhibition that could be tailored to travel to various institutions,” like art museums and aquariums, he said. Some Alaskans are already doing something along those lines. 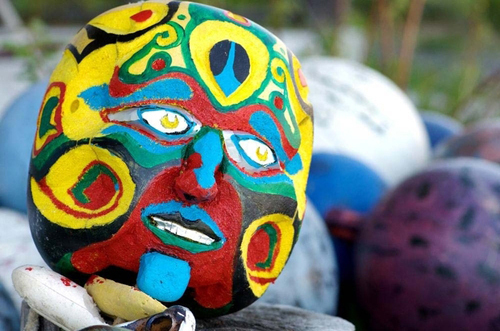 The Center for Alaskan Coastal Studies in Homer, which has organized trash pick-up “coast walks” for years, is turning some of the junk into art this summer. “Drift,” billed as a “Flotsam and Jetsam Art Tour,” features buoys retrieved from the detritus collected during the clean-up walks. 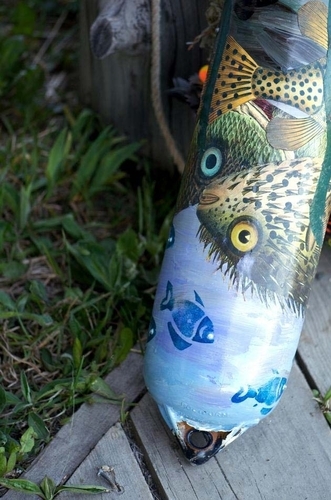 This spring, the buoys were handed out to local artists who decorated or otherwise reconstituted them in imaginative ways. The finished products were presented at a group show June 4 and are now displayed in 25 locations on both sides of Kachemak Bay. Tyler is Homer’s grand old man of professional painting, having worked in the town for more than 50 years. “I’m already getting people coming up and asking, ‘You’re doing this again next year, right?’ ” said Dufour. “Drift,” which resembles Anchorage’s “Wild Salmon on Parade,” will remain on display through the first week of September. The art then will be auctioned off with half the proceeds going to the center and the rest to the artists. The Center for Alaskan Coastal Studies’ auction will coincide with this year’s coast walk. The Kenai Peninsula gets its share of oceanic garbage. A 55-day project in 2007 took 90,000 pounds of debris from 72 miles of coast on the southern side of the Peninsula — by no means a record. That’s not easy when so much of modern life is tied to plastics. Within arm’s reach as I type this are dozens of such objects: CD cases, glasses, headset, hand lotion bottle, phone, gum dispenser and the computer keyboard itself — all handy and, to some extent, indispensable. “The buoys are a useful tool,” said Dufour. “But when they get discarded, they become trash, pollution. It has already made a difference for Longobardi. “Since I started this project, I’ve changed my own behavior. Others tell me that they’ve seen my work and started recycling. PAM LONGOBARDI will speak at 7 p.m. Tuesday at the Anchorage Museum, 625 C St., and at 6:30 p.m. Thursday at the Alaska Sealife Center, 301 Railway Ave. in Seward.